I forced my daughter out in the dark and rain today to visit today’s new place of the day. 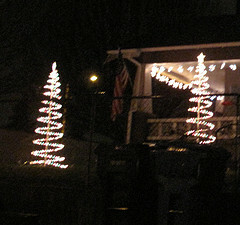 But that was alright because I knew what I wanted to visit, the bush lite up like a holiday dragon across the street from the public library. It is always glowing merrily except I guess on Christmas Eve. So I clicked a couple of photos of the nearby neighborhood. I’ll try the holiday dragon again soon. 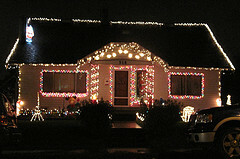 This entry was posted in The Holidays and tagged Christmas lights, holiday lights, night, seasonal on December 24, 2010 by admin.